People rarely type in long URLs. Therefore it's unlikely that one little typo in that long URL is the the deciding factor whether you get a 200 Found or a 404 Not Found. Another thing I often do is I type the start of the domain name and fumble with the Awesome Bar and accidentally try to reach just the start of the domain. Like www.mozill for example. The browser should in these cases be able to recognize the mistake and offer a nice "Did you mean this domain?" button or something that makes it one click to correct the innocent fumble. How it could do this would be quite simple. It could record every domain you've visited based on your history. Then it could compute a an Edit distance and if it finds exactly one suggestion, offer it. Here's the implementation I used. Of course, this functionality should only kick in in the most desperate of cases. Ie. the URL can't resolve to anything. If someone is clever enough to buy the domain name facebok.com they deserve their traffic. 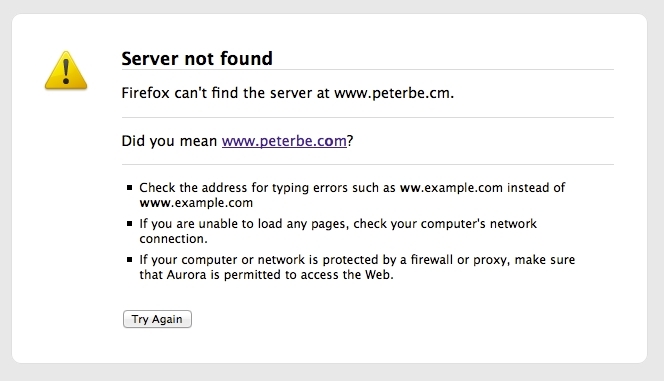 And equally, if you type something like ww.peterbe.com or wwww.peterbe.com I've already set that up redirect to www.peterbe.com. Even better, 404s should to go to search instead. I never want to see a 404 when I'm using the location bar. The edit distance to local history trick would be a nice hack for those who want to minimize searches. Monica, they already do (unless you "search" for something that is actually parseable as a domain). But these aren't 404s really. There's no apache that sends a 404 to make this error appear. This message is what appears if you try query a DNS an get nothing useful back. Right: so if you mistype d3js.org as d3.js, then it should fallback to search.